Definition at line 637 of file conmsg.h. Definition at line 639 of file conmsg.h. 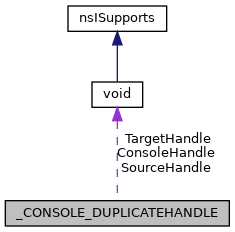 Referenced by CSR_API(), and DuplicateConsoleHandle(). Definition at line 641 of file conmsg.h. Definition at line 642 of file conmsg.h. Definition at line 643 of file conmsg.h. Definition at line 640 of file conmsg.h. Definition at line 644 of file conmsg.h.